Guinea pigs are classified in order Rodentia, although there is a minority belief in the scientific community that evidence from mitochondrial DNA indicates that the Hystricognathi may belong to a different evolutionary offshoot, and therefore a different order. Despite their common name, the animals are not pigs, nor do they come from Guinea. 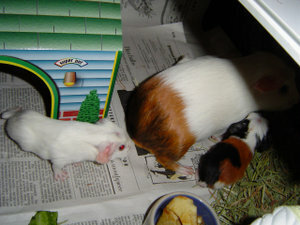 Although there are from 6 to 9 different species, the one most familiar to people is C. porcellus, the common guinea pig. 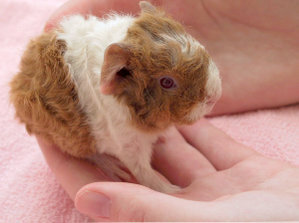 The majority of information in this article is about the common guinea pig. The common guinea pig was first domesticated c. 2000 BC for food by the Inca, in the Andean region of South America, in what is now Peru and Bolivia. They continue to be a food source in the region, subsisting off a family's vegetable scraps as a half pet/half future meal. Guinea pigs are called quwi in Quechua and cuy (pl. cuyes) in Spanish of PerÃº and Bolivia. Cuy and considered a culinary delicacy, prepared usually by roasting. The general opinion considers them similar to rabbit in taste, though in colour, taste, and the fineness of bones the gourmet will be reminded of quail. They also play the role of evil-spirit collector in traditional healing rituals. 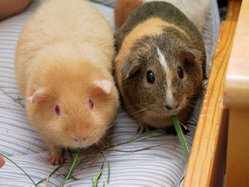 Dutch and English traders brought guinea pigs to Europe, where they quickly became popular as exotic pets. How they came to be thought of as "pigs" is not clear. One thought is that some of the sounds they make reminded people of pigs. They are also built something like a pig: a large head relative to the body, a stout neck, and a rounded rump with no tail of any consequence. As well, in Peru and Bolivia they are often cooked and served, like pork, in their de-haired skins. Whatever the reason, this perception of pigginess occurred in many languages other than English; the German word for them is Meerschweinchen, literally "Little Sea Pigs" (sailing ships stopping to reprovision in the New World would pick up stores of guinea pigs, which provided an easily transportable source of fresh meat), the Russian and Polish word for them is similar: "morskaja svinka" (ÐœÐ¾Ñ€Ñ�ÐºÐ°Ñ� Ñ�Ð²Ð¸Ð½ÐºÐ°) and "Å›winka morska" respectively, meaning also "Little Sea Pig". The French word is Cochon d'Inde, (Indian pig), the Dutch used to call it guinees biggetje (Guinean piglet), and in Norway, Sweden and Denmark they are called marsvin (a combination of the Latin word mare for ocean, and Norwegian/Swedish/Danish svin which means pig). In Greek they are called 'indika xoiridia' (Small Indian Pigs ; Î¹Î½Î´Î¹ÎºÎ¬ Ï‡Î¿Î¹Ï�Î¯Î´Î¹Î±), and in Portuguese, the term is "porquinho da Ã�ndia", literally "little pig of the Indies". However, this perception of pigginess is not universal to all languages or cultures. For example, the common Spanish word is 'conejillo de Indias' (Indian bunny rabbit). Prices current as of last update, 04/18/19 10:57am.